The infamous plug that was the source of my aggravation. It can be inserted into the 13 pin female 180 degrees off! In other words, it fits both ways! Who designed this thing? Anyway, when you put in your 13 pin plug, be careful. You may end up cursing your computer, your software or your hardware and a simple mistake made weeks before may be the problem. (It is the plug on the left, by the way). K2CYS is the happy owner of a brand new MicroKeyer II by MicroHAM. It is an amazing piece of gear: full built in soundcard so all the digital modes are covered, real FSK for RTTY and, of course, a K1EL keyer for full integration into the Field Day software and the regular logging software (Logic9 from Hosenose.com – the best logging software out there.) But, even with 41 years of experience, stupid mistakes can still cause aggravation. So what did I do? There are two microphone inputs. Let’s call them A and B. A is the back. B is in the front. So far so good. But the A input is an RJ45 modular jack. So, MicroHAM provides at patch cord from the microphone to the microphone input. Ok. No problem. After setting up the unit to take the proper microphones, I used the patch cable to hook up the microphone in the back. But whenever I put the microphone in, it would key the radio. So, I knew the radio keyed but why was it keying the radio? I took the unit apart to make sure that that the mic was set up properly. It was. I got a bit frustrated and figured I would come back the next day and tackle it again. The next day it occured to me that maybe I was using the wrong cable. Yep. I had used a cable I had for a different patch cord assembly and found the proper mic patch cable for the MicroHAM. Amazing what happens when you use the correct parts! That did it. The next problem was that the mic I was using with the IC7300 was way too hot. Luckily, I had another Icom desk mic lying around and used that one. It worked perfectly. 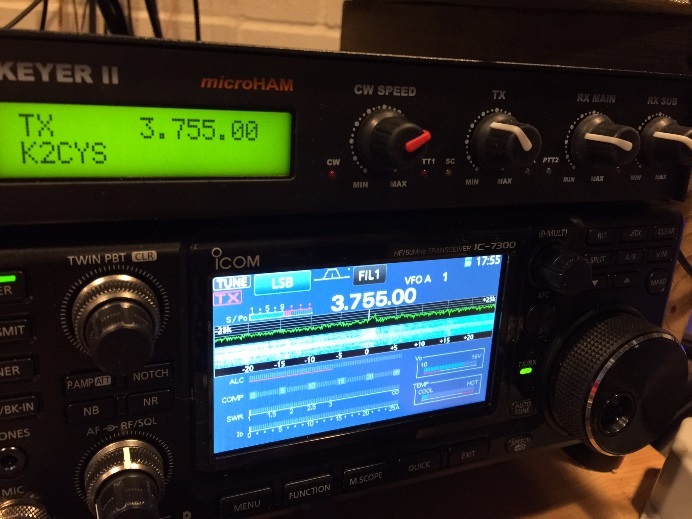 The challenge now was to learn the IC7300, an SDR radio that is nothing short of amazing and incredible. It will be my Field Day radio and the 756 Pro III will be placed in an operating position. The next challenge is setting up the HF rigs and setting the switches for each. Could be fun. It could also cause untold consternation. Keep posted. Okay, so everything was working perfectly UNTIL I took the microphone off line. Then nothing worked properly! I thought I had all the settings down right but still NO audio to the computer and, therefore, to all the programmes that depend on the audio. I simply could not figure out what was going on. I had emailed the W2TV, the designer of the MicroHam II and told of him of my troubles. He walked me through it but everything he said, I had already done! So, the next morning I went to work, did my thing, and came back to the best email I have every read: “You may want to check the input to the radio as the connector is easily turned upside down (!) and that would route the audio all wrong.” So, sensing that this was the problem I checked and, sure enough, it was upside down! Can you believe it? 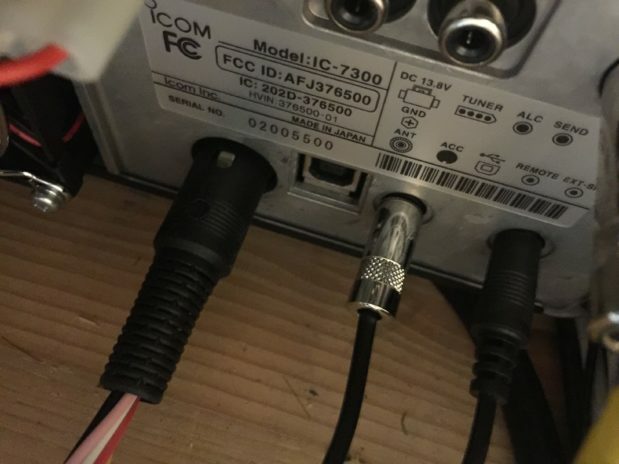 42 years of ham radio and the darn connector was upside down on the 7300? Unreal. I oriented the connected and ZOWIE! it worked beyond perfectly! I had to adjust audio levels down. I had to set up the ALC on the radio to the correct settings and I had adjust the software properly. Amazing what happens when everything is plugged in correctly! Lesson learned (again). Check ALL your connections again and again and then see if if it all works.